The EDM Conference was held in Wuhan this year, from June 25 to June 28, and for the third time it held a Journal track which was edited by Agathe Merceron and Radek Pelánek this year. 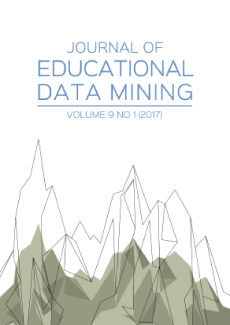 The Journal track allows papers submitted to JEDM to be presented at the conference. A summary is available in the proceedings, and the full text is published in the Journal. The Author retains copyright in the Work, where the term “Work” shall include all digital objects that may result in subsequent electronic publication or distribution. Upon acceptance of the Work, the author shall grant to the Publisher the right of first publication of the Work. No Derivative Works—other users (including Publisher) may not alter, transform, or build upon this Work,with the understanding that any of the above conditions can be waived with permission from the Author and that where the Work or any of its elements is in the public domain under applicable law, that status is in no way affected by the license. The Author is able to enter into separate, additional contractual arrangements for the nonexclusive distribution of the journal's published version of the Work (e.g., post it to an institutional repository or publish it in a book), as long as there is provided in the document an acknowledgement of its initial publication in this journal. Authors are permitted and encouraged to post online a pre-publication manuscript (but not the Publisher’s final formatted PDF version of the Work) in institutional repositories or on their Websites prior to and during the submission process, as it can lead to productive exchanges, as well as earlier and greater citation of published work (see The Effect of Open Access). Any such posting made before acceptance and publication of the Work shall be updated upon publication to include a reference to the Publisher-assigned DOI (Digital Object Identifier) and a link to the online abstract for the final published Work in the Journal. Upon Publisher’s request, the Author agrees to furnish promptly to Publisher, at the Author’s own expense, written evidence of the permissions, licenses, and consents for use of third-party material included within the Work, except as determined by Publisher to be covered by the principles of Fair Use. the Work contains no libel, invasion of privacy, or other unlawful matter. The Author agrees to indemnify and hold Publisher harmless from Author’s breach of the representations and warranties contained in Paragraph 6 above, as well as any claim or proceeding relating to Publisher’s use and publication of any content contained in the Work, including third-party content.